* This is my column in BusinessWorld last Monday, July 23. After two years in power, the Duterte administration, its economic team, and its policies can be considered as fair to poor. Here are five reasons why I say this. Inflation. The Philippines’ inflation rate for the first half of 2018, has surged to its highest in recent years, compared to the previous year. The administration and its supporters point to high world oil prices as main reason for inflation. But that is not valid. Several countries have reported a decline in their domestic inflation rates despite high global oil prices. The country’s high inflation rate was the result of the TRAIN law and its corresponding tax hikes on many commodities such as oil, LPG, electricity transmission, among others (see Table 1). Economic growth. The government has been unable to optimize the fast growth trends experienced by many countries. For instance, the growth difference in 2017 vs average growth posted in 2014-2016 was 1.5 percentage points for Thailand, 1.4 for Hong Kong, 0.8 for Malaysia, Singapore, Taiwan, and Japan. For the Philippines, the rise was only 0.4. 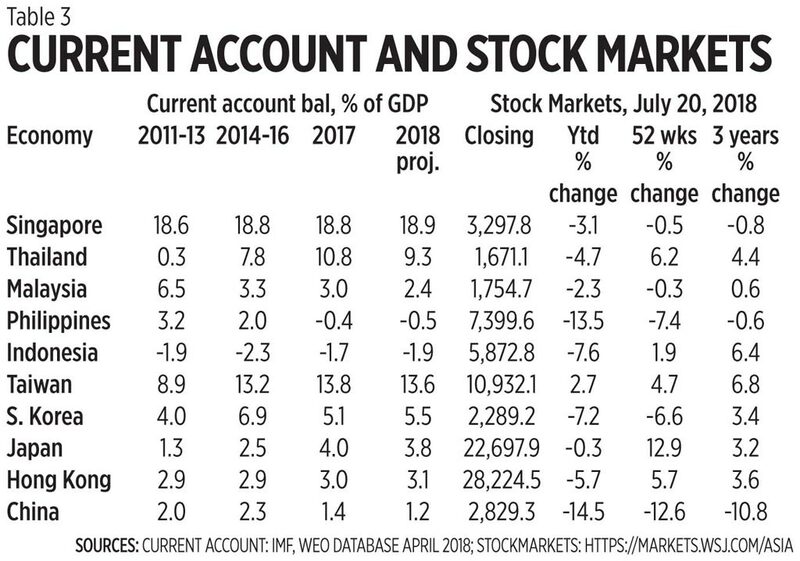 This outcome fares poorly compared to the growth trajectory set by the previous administration, such as a growth rate of 6.7% in 2012, 7.1% in 2013, and 6.9% in 2016 — the last year of the previous government and first year of the current administration (see Table 2). 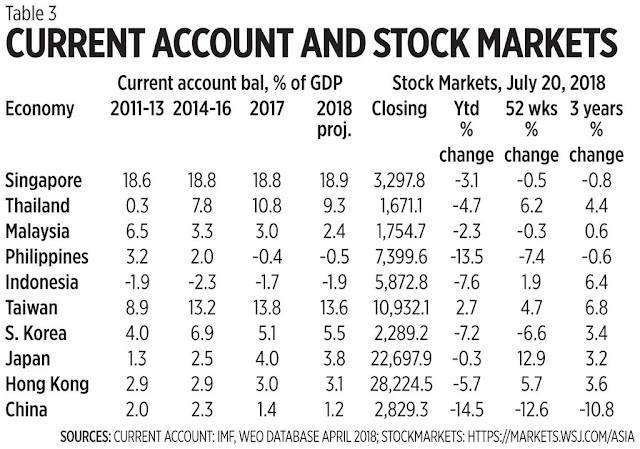 Current account. Net for exports vs imports of goods and services, net for remittances and transfers, the Philippines is on a downhill and in negative territory, the worst performing among ASEAN 5 and North East Asia. Stock markets. The Philippines is the third worst performing in the world year to date (Ytd, January 02 to July 20) after Turkey (-18.4%) and China (Shenzhen -16.1%, Shanghai -14.5%). Achievements in the last three years of the Philippines were actually negated or reversed this year with -0.6% change (see Table 3). Inflation for the poor. This is getting worse this year at 5% vs 4.3% experienced by all households on average. Data from Dr. Dennis Mapa, Dean of the UP School of Statistics (UPSS), show that food and non-alcoholic drinks constitute 61% of consumption by the poorest 30% of the population, vs only 38% for all households. It is these items that posted faster inflation. Full-year 2018 inflation for the poor is 5.5-6% vs only 3.1% in 2017 or almost double this year (see Table 4). Based on these five categories, the Philippines performed BADLY in four: (a) rise in inflation this year compared to many Asian economies, (b) current account balance, (c) stock markets, and (d) inflation for the poor. The Philippines did fairly well in only one factor, GDP growth but potential growth could be much higher. 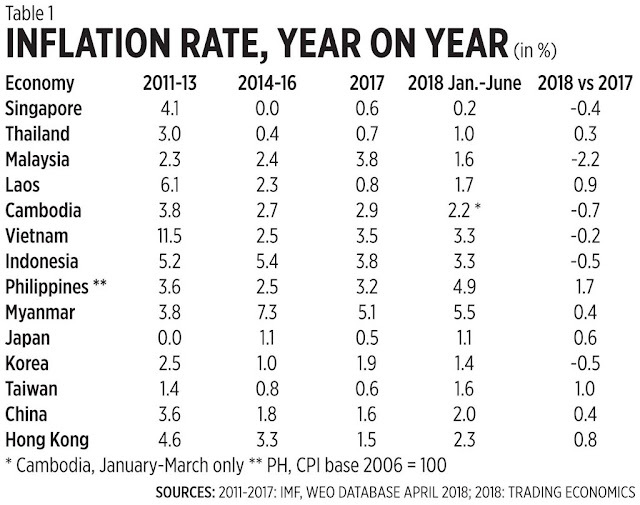 Fast growth with low inflation is possible, not contradictory because this is a “demand-pull inflation due to lower personal income tax” as claimed by Dutertenomics and its supporters. 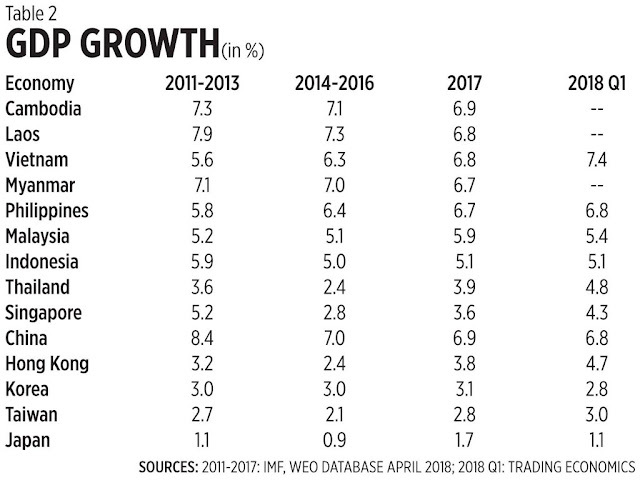 Cambodia, Laos, Myanmar, Vietnam (CLMV), Indonesia, Malaysia and China have posted fast growth (5% and above) yet have low inflation. 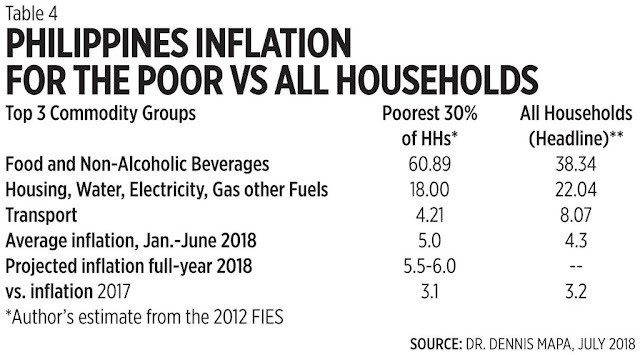 Now there are three factors that will further raise the country’s inflation rate: (1) fare hikes by taxis, UV expresses, and buses still pending, (2) wage hikes by firms reeling from uncertainties of TRAIN 2 and removal of incentives, and (3) round 2 of oil/lpg/coal tax hikes by January 2019, round 3 in January 2020. Dutertenomics lack humility and honesty in admitting to the mistakes of their TRAIN 1 design. They blame many factors — high world oil prices, “profiteering” by private businesses big and small, peso depreciation, etc. To compensate for such mistakes, Dutertenomics should consider tax cuts somewhere and reverse the high inflation momentum. Among these include reducing VAT from 12% to 8% and cut exemptions, slashing corporate income tax (CIT) from 30% to 15% and then removing several fiscal incentives, and controlling public spending by stopping freebie programs such as free tuition in all state universities and free irrigation — which were all enacted in 2017 or months before TRAIN law was implemented. Last but not the least, the government should not proceed with the creation of new states or regional governments as proposed in the ConCom draft. The proposed federalism will create another bureaucratic layer with the installation of state governors on top of provincial governors, municipal, and city mayors. Federalism in the US, Canada, Malaysia, etc. do not have provincial governors, only state governors. SONA 2018 should be an opportunity to display humility and more honesty in economic policy making. But for now, this looks like wishful thinking as Dutertenomics embark on the path of more taxes, more government, more loans, more inflation.